Research is generally characterized as basic or applied. Basic research seeks new knowledge without necessarily having potential applications in mind, whereas applied research is more focused on addressing specific problems. Research has been primarily funded by federal and state governments, industry, universities and philanthropy, but its investment dynamics have significantly changed over the decades. Following World War II, government funded roughly two thirds of all R&D, while industry funded one third. Those shares have now reversed. Industry now accounts for over two thirds of all R&D, and given the more intense global competition and the pressures from financial markets, the bulk of its investments are focused on development and short-term applied research. State governments’ support of their public research universities has significantly declined over the past decade given the budget challenges that just about every state has been facing. Philanthropy is an important but relatively small source of funding in specific areas like medical research. Today, the federal government is far and away the major funder of long-term basic research. It has a natural responsibility to fund research that will serve the public good and enhance the nation’s future prosperity. Federally-funded basic research is mostly performed in universities, research institutes and federal research labs, while the major responsibility for translating the results of that research into economic advances and jobs rests with the private sector. The research ecosystem thus requires close collaboration among government, industry and academia and the smooth flow of ideas and talent among these various institutions. To ensure the long-term health of the US research enterprise, the Academy study offers three overarching, actionable recommendations. Secure America’s Leadership in Science and Engineering Research – Especially Basic Research – by Providing Sustainable Federal Funding and Setting Long-Term Investment Goals. From 1975 to 1992, annual federal investment in basic research grew by an average of over 4% despite serious economic challenges including the 1973 oil embargo and high inflation between 1979 and 1982. Despite political differences, both parties were in agreement that federal funding of basic research should be a high national priority. 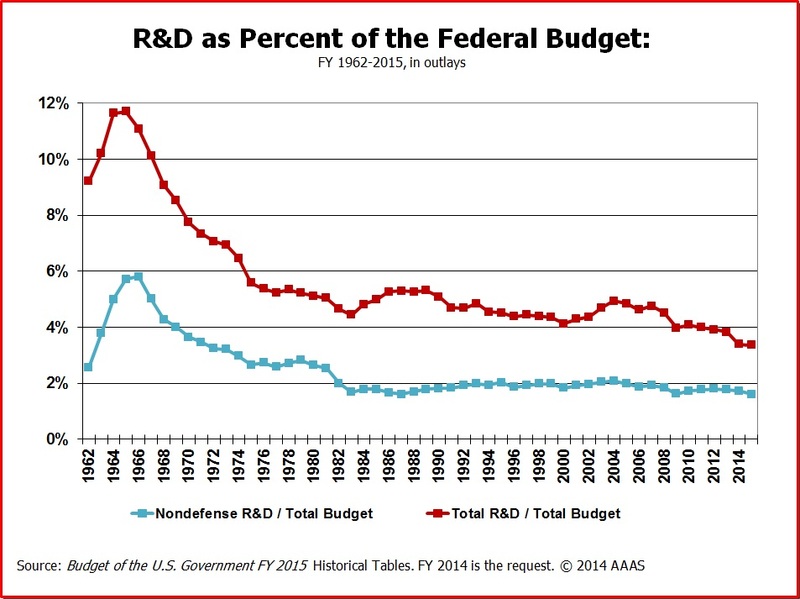 But research funding has stagnated, since the end Cold War over 20 years ago. It has also become more unpredictable due in part to the increased polarization in Washington, making it harder for funding agencies and researchers to plan longer term programs. The report recommends restoring the 4% growth rate in federal investments in basic research. In addition, it recommends that the federal government should adopt multiyear appropriations for agencies that primarily support basic research and graduate STEM education. Ensure that the American People Receive the Maximum Benefit from Federal Investments in Research. The report discusses a number of obstacles that stand in the way of more effective federal policies, such as the lack of effective prioritization of R&D investments. There are no mechanisms in place to ensure that the American people and policy makers have access to the latest data and analysis on the state of the nations R&D and its implications to the US economy. The report recommends that the President publish a biennial “State of American Science, Engineering & Technology” giving the administration’s perspectives with inputs from all relevant federal agencies. The report also notes that decades of accumulated rules, regulations and business practices by different federal agencies are placing unnecessary bureaucratic requirements on researchers and their institutions. It recommends that the administration should lead an effort to streamline or eliminate those practices and regulations that have become burdensome while failing to yield appreciable results. Regain America’s Standing as an Innovation Leader by Establishing a More Robust National Government-University-Industry Research Partnership. Finally, the study points out that many of the strong research partnerships among government, industry and academia that were established after WWII are no longer working, and their erosion has contributed to the decline of America’s R&D leadership. Other countries recognize this need and have been establishing national R&D programs to improve their global economic competitiveness. The US needs to reestablish these partnerships, and each participating sector should accept its responsibilities in support of the overall research enterprise. In addition, the report recommends that the nation’s universities should embrace innovative models for technology transfer that better support their research and educational mission while facilitating strong research partnerships with industry. At the same time, it urges chief executives and corporate boards to give higher priority to funding basic research in universities and develop new forms of partnerships that can best justify these strategic investments. A long complicated topic, starting with the obvious that the Academy is by definition biased so reform efforts need to be taken up by others. I've worked with the system for about 30 years now with several hats. While I agree with the conclusions, typically it's very soft on accountability and heavy on more funding. It is the failure of the basic research system that has substantially led to the decline of the American dream. If it had been more efficient and less corrupted with more accountability, less activism and more science--with more economic diversity, the structural foundation of the economy would have been stronger. Unfortunately now that the U.S. economy has been so weakened it is a much greater challenge to invest in federal research. For example, the national debt is more than 10x of the level cited in earlier times, which is frankly due less to partisanship (don't deny that is among our greatest challenges, but it's primarily a symptom of this, not the cause) than he culture of academia and lack of accountability throughout the federal system, including regulators, which is very closely aligned with academic institutions they fund. I know many and am often invited to attend four and five star hotel conferences, but of course since I pay my own way I stay down the street in budget lodging. The biggest problems I see with the research system include extreme bias towards the academy itself rather than merit-based research (they fund themselves as part of the guild's unspoken rules), the state funded universities export most of the IP and IC to leading companies--much of which doesn't benefit the state citizens at all, a great many are gaining enormous wealth from this broken system--including some very highly paid administrators as well as start fundable researchers, majority of investment isn't an investment at all but rather a political statement supporting ideology, and of course the bureaucracy cited has become ludicrous. An example, I recently met with two of the leading researchers with institutions that are among top funded by fed R&D in their disciplines. They started their institutions roughly two and three decades ago, one of which said when he started he spent 10% of his time on administration and 90% on research. Today it has almost reversed- 15% to 85%. The other was so frustrated by the system the individual just wanted to discuss immediate plans for retirement. Here in NM we have an extreme example, but it's also among the most pure cases to study. Despite ever increased basic R&D from primarily federal government sources--ranging now above $5 bn per year and representing most of the highly paid persons living in NM, and a mandate by the institutions and most of the agencies funding to grow NM tech businesses, the state has never enjoyed a single major business success from the vast federal investment in these institutions. Yes there have been many small successes for researchers, institutions, and investors, but like most of the flyover states they are acquired by the G500 or are forced to relocate from funding in major markets that have regional mandates as part of the partnership agreements in VC firms. The result is we have what has been described by one leading researcher as one of the most polar society's and economies in the world, with federally funded institutions at the top of the hierarchy and those they are charged with serving at the bottom. Our friends at the Academy are not the appropriate source to be reporting on this as they are obviously extremely conflicted emotionally, financially, and in every other sense. The system needs to be completely re-invented, but given the power of this lobby in D.C. with corrupted political system I fear it's unlikely at best. This is why we self-funded Kyield btw. It would almost certainly not have survived and matured in any other model.